In downtown Amman, Jordan, the Al-Balad Theatre is quiet. Both performance spaces are empty and Cultural Producer Mu’ath Isaeid sits alone in a small office. Aside from the call to prayer drifting in through the window, this could be any independent theatre in Sydney. Or anywhere, for that matter. As with most theatres, the cumulative flood of fear and elation poured into the space by performers and audiences over the years has seeped into the walls. There is no sound, but the stillness carries an unmistakable charge. Al-Balad is Jordan’s only independent theatre. Operating since 2005, their focus centres on community engagement, the fostering of developing artists and cultural exchange through art. Baladdak alfinn liljamie, which Isaeid translates for me to “your country” and “art is for all” is the motto of Al-Balad’s annual graffiti festival, but it might as well be the slogan for the theatre. Al-Balad is a little over a decade old, but the building itself has a much longer artistic history. It was a cinema in the 1940s, but fell out of use in the decades following and was abandoned. In 2002, following a conference on developing alternative creative spaces, the Arab Theatre Training Centre partnered with the Young Arab Theatre Fund and the Amman International Theatre Festival to renovate the cinema. "The mainstream theatres are always tackling the same topics – honour killings, Bedouin culture, politics. These are important, but Al-Balad’s vision is of theatre run by the people." Despite the repurposing, the theatre is still replete with cinematic ghosts. In the foyer, garishly coloured posters with titles that almost tear themselves out of the paper to get your attention serve as the wallpaper for a small community reading space. In the lighting box, two old film projectors stand watch in the quiet. They look like iron lungs with flattened satellite dishes welded to the top. Isaeid gently unspools a roll of old film he’s pulled from a cupboard. It has yellowed with age, but a tiny street scene, replicated frame after frame, is still clearly visible. He tells me the theatre can’t get permission to run screenings any more, but he is looking for a way to restore the films they have. “There are a lot of Jordanian films that were just screened here, but never got out. And it would be amazing to reproduce these reels for the public,” Isaeid tells SBS. Its approach to art is what makes Al-Balad distinct in Jordan. “The mainstream theatres are always tackling the same topics – honour killings, Bedouin culture, politics. These are important, but Al-Balad’s vision is of theatre run by the people. “They come and propose what they want to do and we never say no. It’s not squared for a small amount of people to decide what to present to the others,” Isaeid says. Al-Balad has built a solid reputation as a hub for community in Amman. Nabil Sawalha is one of Jordan’s most famous comedians and actors. He has been heavily involved in Jordan’s mainstream theatre scene since the 1960s, when he helped introduce political satire. He says Jordanians love to laugh at themselves and that the genre has become very popular. But Sawalha also claims that outside of comedy, life as an artist is almost impossible in Jordan. Al-Balad often struggles to find funding even from these sources. They are continually passed over by the Ministry of Culture and left to survive on project funding and artistic collaborations with foreign theatre companies. “It’s a struggle”, Isaeid says, shaking his head. But he also knows it’s the price they pay for independence. Controlling their own agenda may not have brought financial stability to Al-Balad, but it has allowed them to build a solid reputation as a hub for community arts. “We have many partners in Jordan and many partners are proud to work with us,” Isaeid tells. The main theatre at Al-Balad seats about 180. The walls are a deep red and the stage stretches back several metres. Backstage, ageing, dusty props are crammed under stairways and old messages to cast members are scrawled on the mirror; par for the course, in other words. This, and a small space upstairs act as multipurpose studios for artists working in all mediums. Al-Balad regularly hosts orchestras, dance ensembles, stand-up comedians and poets. It’s also used year round for rehearsals and workshops, seminars and experimental showings. In addition to their graffiti festival, Al-Balad coordinates Hakaya, a two-day nationwide storytelling festival, and a large summer music event in the ruins of Amman’s Roman amphitheatre. This is Isaeid’s favourite. “You give something to the people, something that is not physical and they’re enjoying it and it’s music. It’s the spirit of everything,” he says. 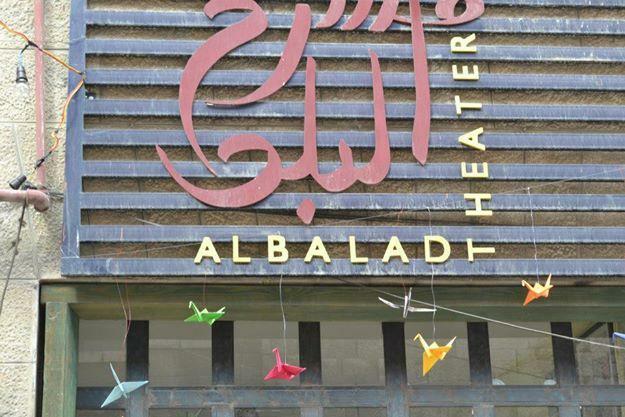 Like many independent theatres, Al-Balad’s future is uncertain. But it’s the people, not the money that make the space, encourages Isaeid. He comes to see us off and have a cigarette. He tells me to pull the door shut and for a second before it closes, in the renewed silence, the subtle, emotional residue of past performances rushes through the closing gap.